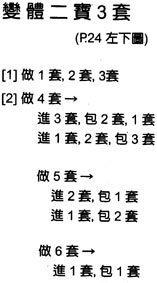 Published in June 1996, The Treasure Knot (寶結, bǎo jié) by 谭蓬竹 (tán péng zhú) is a wonderful and thorough examination of a new (at the time) and still relatively novel knot. The knot in question: 寶, bǎo translates as "treasure" with a certain "wrapping" connotation which is all highly appropriate just looking at them. The book is also labeled 新的中國結 (xīn de zhōng guó jié) or "New Chinese knot(s)". Subtitle or advertising copy? The book begins with what is no doubt a well written preface, then has an orderly display of bao knots increasing in complexity, with colour variations and ear sequencing modifications as well as the woven bao knots and ending with some tied on the bight à la good luck knots (24 pages). Then a nice gallery of projects with extensive text descriptions. Ending with a 2 page résumé (?) of the author. 95 pages (96 counting the page of publishing information). I did go through and try to translate the instructions for my own edification, and the numbers are loop numbers which are numbered as they are constructed, and the 2 relevant characters are "wrap" and "through", basically a more dimensional version of "over" and "under". This is not a beginner's book! For a long time the woven knots eluded me, especially since I didn't realize what they were. Translating the text of the names only says "variation". But after brute force duplication of the 2x2 and 4x2 woven knots I realized what they were and after several mind-bending sessions I deduced the correct setup and process for tying them. Now the only mystery left is how to merge 2 knots by the ears so that it has an extended double structural centre. This is a beautiful and inspiring book with excellent photography, brimming with ideas. It is not, however a book for beginners or those who like their instructions to be extensive and bullet-proof. Note about the second character of the author's name: As written in on the book it has 2 dots over the radical instead of 1 (辶 (chuò)). My parents tell me that this is a Mainland vs Taiwan artifact. It is the same character hence I can't get my Chinese data entry to give me the 2 dot version. Searching on the author's name, one finds the author has written a new book (2008) on tassels!